OK folks, let me preface this post by saying that this is a direct result of an artist taking a photo of mine, downloading it from my website, cropping out my watermark, lowering the quality, and then re-uploading it to their Twitter and Facebook sites and giving no attribution. This is a living, breathing, indexed resource for all concert photographers, so if you have something to add, either and experience, tip or copyright info, please leave a comment. I have been shooting live music for almost five years and I am always happy to see the bands I photograph share my images via their social media channels. That is one of the main reasons I do this, to help promote bands that I love and do my best to capture their essence and energy live in order to share it with the world. It’s a passion that doesn’t pay very much at all, so when someone steals a photo and refuses to give attribution or credit, it really hits home. As a professional photographer I have spent a tremendous amount of my own time, energy, and money to support my passion, not to mention the hours of post-processing and writing of reviews. If someone takes that for granted, it can be incredibly frustrating. Every day artists, bands, singers, songwriters, fans, and more are sharing copyrighted images across social networks, and in my opinion that’s perfectly OK, as long as it was uploaded to the social network of choice by the copyright holder themselves. As a professional photographer I appreciate the exposure and often encourage it, but sometimes my images get saved, downloaded, re-uploaded, cropped, and manipulated beyond recognition, and that’s where the problems begin. One of the most famous cases of this happening is when the band Red Jumpsuit Apparatus took a photo, cropped it down, lowered the quality and posted it without any credit or even a thank you to the original photographer What happened next was unbelievable. That photographer was Rohan Anderson and I think he hit the nail on the head in a statement on his personal blog recapping the entire incident. My new friend Patrick O’Keefe, who has some experience with copyrights infringement, took a few minutes to share with me the technical aspect of how sharing a copyrighted image works in this instance. 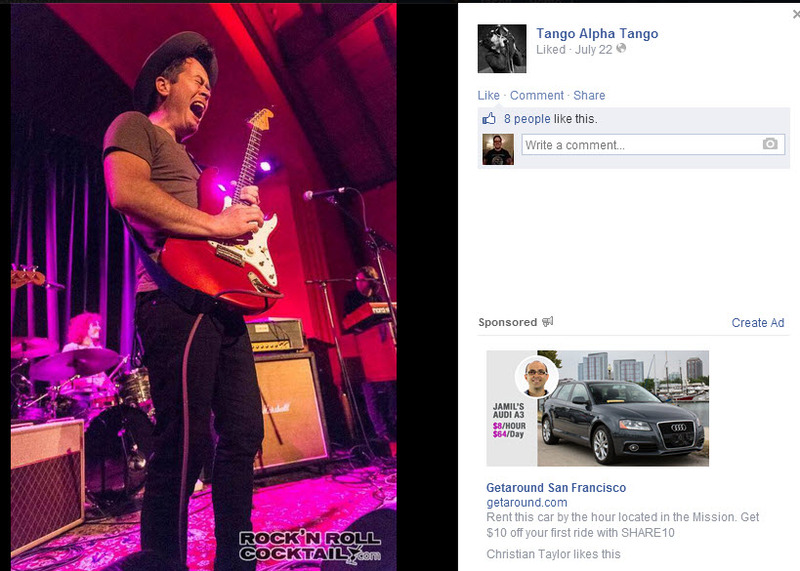 “Technically speaking, a band cannot take a photo, use it on their website, Facebook, Twitter, etc. – even if they include a credit link, even if they maintain a watermark, even if they include “no copyright infringement intended.” None of that matters. That’s the technical version which I can appreciate, but in the real world of social media, there is certainly going to be a lot of grey area. So what I propose is a compromise that I think a lot of my fellow photogs can agree with. If you are a band and you take someone’s photo in order to post it to a social network, just say thank you and give them credit. If you do that simple thing it works out for both the artist, the photog and most importantly, the fans. Refusal to do this coupled with snarky comments for doing so can easily get out of hand which isn’t good for anyone involved. With that being said, I thought I would share a few examples of artists that have shared my photos and some of my friends photos across social networks that can be a nice compromise. I personally have no problem with band’s sharing in this manner with our without asking permission. 1. 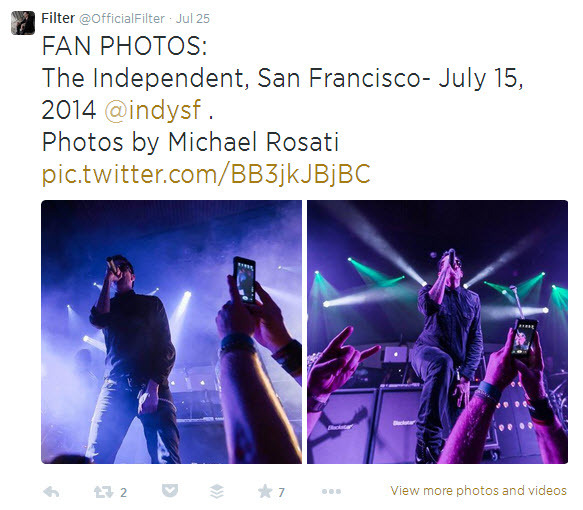 A fantastic example of one of my favorite bands Filter sharing a friend and fellow photog Michael Rosati’s photos from the recent show here in San Francisco. 2. 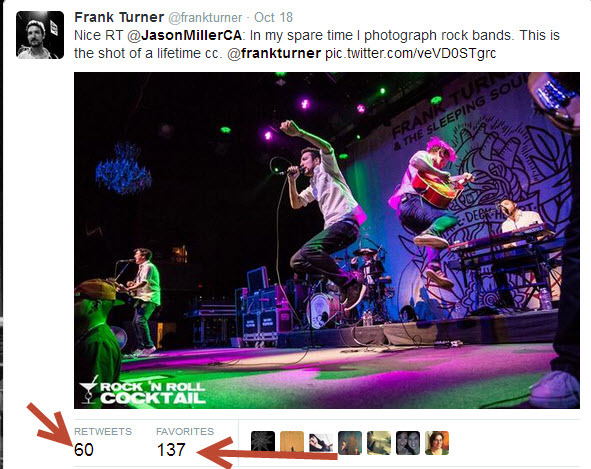 I love this one, quick and simple retweet from Frank Turner. Look at those engagement numbers by the way! This is essentially free publicity for Frank. 3. 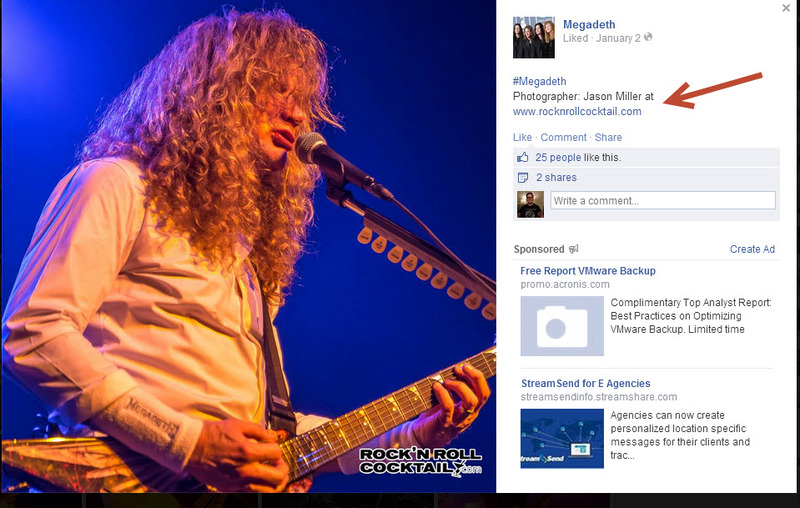 The almighty Megadeth always go out of their way to properly credit their photogs and it shows. Thanks Megadeth! 4. The fine folks over at the Monsters of Rock Cruise are constantly sharing photos from the many pro photogs on the boat which drives a tremendous amount of engagement. 5. This is especially great for up and coming bands such as the one below. Sharing the original with the watermark in place. Nicely done. 6. Another great example of a band on the rise, I shot this band and absolutely loved them. The have been nothing but thankful and respectful in their sharing. This was a tough room to shoot and I pulled out what I thought to be some great photos, it wasn’t easy but I am happy that the band is happy with them. This isn’t a money thing as I am not that concerned with financial gain. What I do is try to capture a moment and give the artist something inspiring. Thanks for reading. 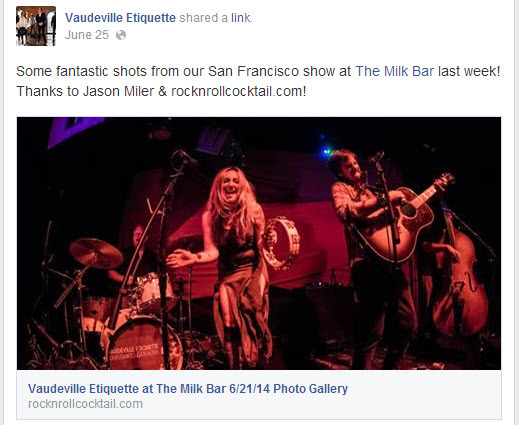 How do you feel about band’s sharing your photos across social media sites? Sometimes common sense eludes us all. press release submission sites, classified ad resources, weblogs and forums where links can be obtained. site will be visited by other forum participants. The Amazon Associates program is the biggest option here but depending on what you sell the returns can be quite disappointing, they pay different percentage rates on different products.